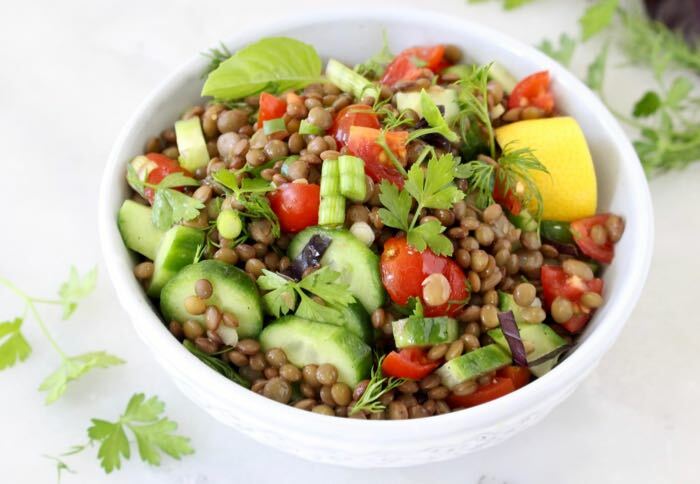 High in protein (a cup of lentils contains 18 grams) and loaded with soluble fiber (a cup contains 16 grams) with a low glycemic-load. Rich in folate, iron and manganese. 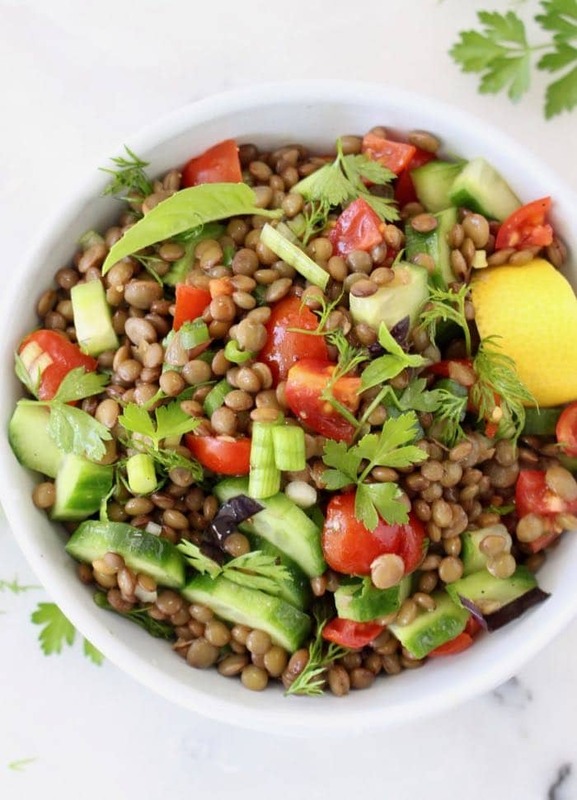 There are over fifty varieties of lentils, I used the small French variety here as it holds its shape nicely and doesn’t turn into mush, but I’m pretty sure whatever lentils you have hanging in your pantry at the moment could work too. 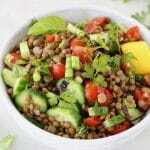 A Black Beluga Tomato Lentil Salad would be gorgeous! It’s really important that you don’t overcook them so check after 10 minutes or so, go for an al dente texture that will hold up to the tomatoes, cucumbers and dressing. In 1893 the U.S. Supreme Court ruled that the Tomato will be legally classified as a vegetable, even tough technically it is a berry, and botanically it’s a fruit. True story! 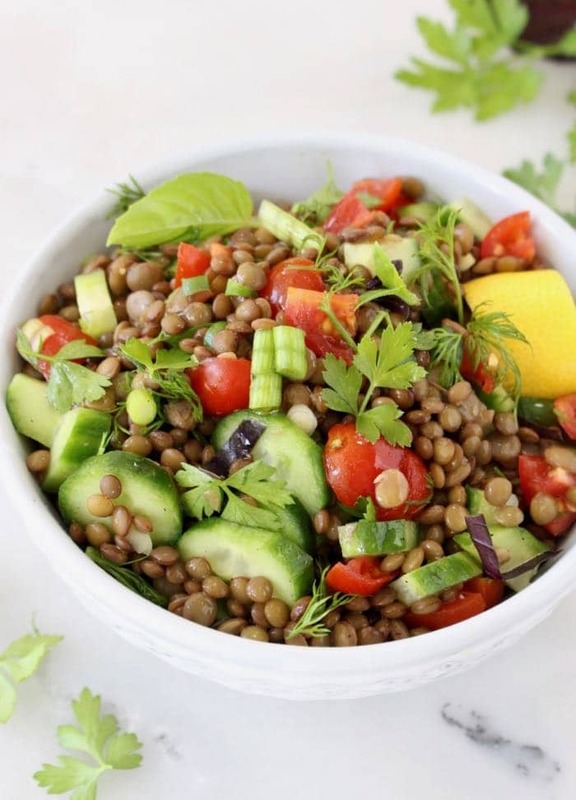 the Best Cucumber Tomato Lentil Salad, ever - in a fresh and zesty lemon dressing with dill, parsley and basil. Lovely served cold in any season, packed in mason jars for lunches to go, picnics and perfect for those long hot summer days. 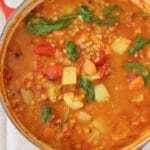 Add the lentils, water and bay leaf to medium size heavy pot. Bring to a boil and season with a good pinch of sea salt. Simmer uncovered for about 15 minutes or until the lentils are cooked through. Drain in a colander and discard the bay leaf. Transfer to a bowl and refrigerate until chilled. Meanwhile slice the cucumbers into thin rounds or chop into squares to your liking. Add them to a salad bowl together with the tomatoes, dill, basil and parsley. Add the chilled lentils and drizzle over the top with the olive oil. Squeeze lemon juice on top to your liking and gently toss everything to coat well. 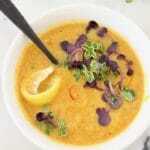 Taste as you go and adjust seasonings to taste with more sea salt and extra lemon juice. 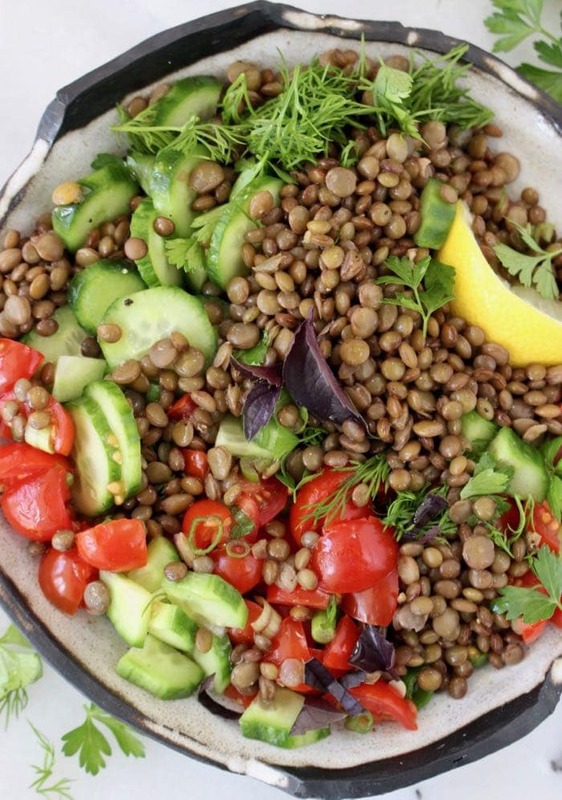 Never thought of using lentils in a cold salad but you can bet I will be doing this from now on. This is a really flavorful and filling salad I’ll keep in my repertoire for years to come. Perfect for a summer outdoor picnic or to bring to a potluck too. Thank you for this recipe Florentina.